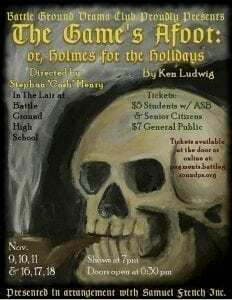 BATTLE GROUND — The Battle Ground High School Drama Club is set to perform Ken Ludwig’s “The Game’s Afoot: or, Holmes for the Holidays,” a Sherlock Holmes murder mystery comedy set during the Christmas holidays. The Battle Ground High School Drama Club is set to perform a Sherlock Holmes murder mystery comedy set during the Christmas holidays. It is December 1936 and Broadway star William Gillette, admired the world over for his leading role in the play “Sherlock Holmes,” has invited his fellow cast members to his Connecticut castle for a weekend of revelry. But when one of the guests is stabbed to death, the festivities in this isolated house of tricks and mirrors quickly turn dangerous. It’s up to Gillette himself, as he assumes the persona of his beloved Holmes, to track down the killer before the next victim appears. The danger and hilarity are non-stop in this glittering whodunit. The show runs Nov. 9-11 and Nov. 16-18. Performances will be at Battle Ground High School in The Lair, 300 W Main St. with the doors opening at 6:30 p.m. Tickets cost $5 for students and senior citizens and $7 for the general public. Tickets are available for purchase at the door on performance dates and online at https://payments.battlegroundps.org. To honor servicemen and women during the Veterans Day weekend, any active duty or former military service members will receive free admission to the shows on Fri., Nov. 10 and Sat., November 11. Simply show your Military ID card, or come in your uniform, and enjoy the show for free. Thu., Nov. 9, 7 p.m.
Frid. Nov. 10, 7 p.m. Sat., Nov. 11, 7 p.m. Thu., Nov, 16, 7 p.m.
Fri., Nov, 17, 7 p.m. Sat., Nov, 18, 7 p.m.